This is something from another century. Both the machine and the timeless art of sewing sarees. I'm posting it on behalf of my mom who sews. His machine looks more updated than my tailor here but the petal is the same. Good to know you can use it without shoes on! Was it all men in there sewing? I think they appreciated not have to wind it by hand. 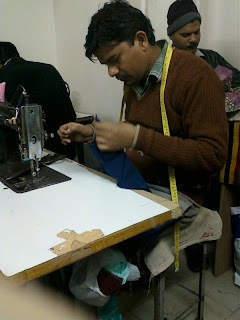 All men sewing. Four of them. The other woman and I were there waiting for our stuff. Gotta admire and appreciate those guys! They do beautiful work as well! It reminds me of the art of playing a pump organ! Wow, if I did both my legs would definitely be buff! Well, you certainly wouldn't want only ONE buff leg.